INDIAN WELLS, CA. — Baseball Hall of Famer, Willie Mays, has been named the keynote speaker at the annual Champion Honors Luncheon scheduled to be held on Jan. 14, 2015 at the Hyatt Regency Resort and Spa in Indian Wells. The proceeds of the luncheon will benefit the Barbara Sinatra Center for Abused Children. Source: The Desert Sun. 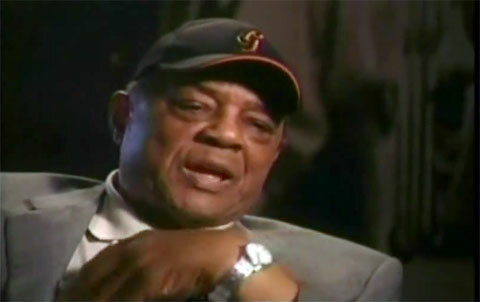 Photo shows Willie Mays speaking about his career in a 2013 interview with Bob Costas. According to John E. Thoresen, director and executive officer of the Barbara Sinatra Children’s Center, Mays will have a conversation with radio personality Marty Lurie, which will highlight the luncheon, although “there will be a couple surprises… It’s more than just a lunch, it’s really quite an entertaining event,” Thoresen said. Last year, the luncheon featured a talk by Major League Baseball Commissioner Bud Selig and in 2013, Dodgers announcer Vin Scully gave a speech and answered questions from the audience. Willie Mays, nicknamed The Say Hey Kid, spent the majority of his major league career with the New York and San Francisco Giants before finishing with the New York Mets. He was elected to the Baseball Hall of Fame in 1979 in his first year of eligibility. Playing Field Promotions is a booking agent for motivational sports speakers and celebrities. If you would like to book Willie Mays for a speaking engagement or personal appearance, contact Willie Mays’ booking agent for appearance & speaker fees at 1.800.966.1380.